Cut potatoes into 1 inch cubes. Place dutch oven over 375 degree heat for Frying. Add potatoes and contents of all cans, undrained. Fill one can about half full of water and pour it between all cans to clean them out. Pour the water into the dutch oven. Reduce heat to about 225 degrees. Simmer until potatoes are soft (about 45 minutes), stirring every 5 or 10 minutes. Let me know how you enjoyed your Cowboy Stew! We were at Horseshoe BSR this weekend with several of the Boys and three adult leaders. Used this recipe for dinner on Saturday night, even though we got a late start did take much longer than advertised. This was a two plate serving for the boys and the adults. Clean up was easy and quick. Nothing but taste great comments from all hands. Try this recipe you it's a winner!!!! @Bruce - Cool! 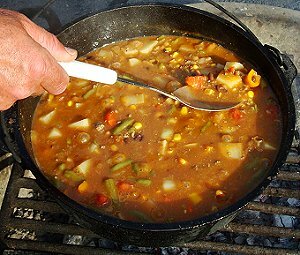 This stew is a pretty good one to make on fall campouts, and it can be made in a pot on a stove instead of dutch oven. I found this recipe online 2 years ago. My sis-in-law loves it as we do. She doubles the recipe and freezes most of it. A great comfort food.